The class is called Move it or Lose it™ and is great fun, often including a game. This class is appropriate for all abilities and provides a warm, sociable atmosphere! Why not…. This is our group in Woodingdean, as you can see the chair is there if needed. 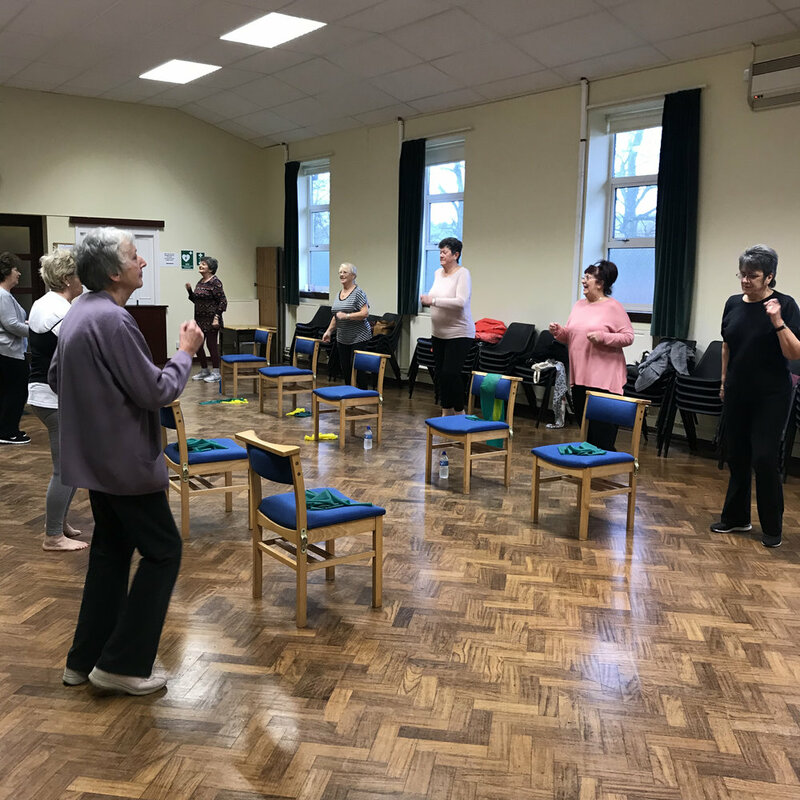 All exercises are taught with an option to be in the chair, standing to the side of the chair for support or freestanding. On the left of the picture is out client Pam, she loves to dance and it helps with her breathlessness. The class is split into four sections (as above). Here is Kate, who has had a knee replacement- working to strengthen her quadricep muscles (front upper leg). Because she is sat away from the back of the chair Kate is also challenging her core muscles. Here is Gloria, Gail, Pam and I. I asked these ladies why they come back- week after week, their smiles say it all. Gail suffers with an old shoulder injury and is still able to participate and enjoy the sessions. In the top half of the picture we have Gail and Josie, below is Maureen and Gail. Move it or lose it does exactly as it says on the tin! As we age movement becomes more difficult due to muscle mass reduction called sarcopenia (we lose between 0.5 and 1% muscle mass per year after the age of 50. In order to retain our muscles we must use it! This is a game called shadow taps which helps our class members to reach, rotate and squat- all movements which we use daily. Would you like to attend one of our Move it or lose it™ classes in Brighton and Peacehaven? Use the button below to list our class Timetable.